1. Put speakers in the rear doors for the ES model. The wires are already there! 2. The shifter is ridiculously notchy. Why do we have to navigate a maze to put my car into "B" mode? How about push buttons? 3. Wider front tires would be nice. The car gets squirrely on the freeway with grooved pavement. 4. The "Ultraman" wiper blades could be consolidated into one blade like the US-model Yaris hatchback. 5. More power wouldn't hurt, but isn't absolutely necessary. It's adequate now. 6. The fancy remote looks (and sounds) like it came from the 90s. Yes, I turned off the sounds. 7. Give us a switch to turn off the low-speed vehicle sound. Even the Prius has that. 8. Have some basic power consumption data easily available without having to using my KillAWatt device. 9. Make the USB cable standard. The radio is already set up for it. C'mon. I have to pay $125 for the cable?! 10. Set the rear seat hinges in the center of the seat back a bit so I can put a child car seat in the middle. 11. A more car-shaped design might be better accepted by the US market. Tesla's "frunk" is a great idea! 12. Put a badge on the back/side stating this is an electric car. Doesn't have to be gaudy; most other EVs have this. That's about it for now. I'm really enjoying this new car! aarond12 wrote: 1. Put speakers in the rear doors for the ES model. The wires are already there! We SE owners have to have something for our extra thousands Look at it this way: it's easy to install your own choice of speakers since the wiring is already there. aarond12 wrote: 2. The shifter is ridiculously notchy. Why do we have to navigate a maze to put my car into "B" mode? How about push buttons? aarond12 wrote: 3. Wider front tires would be nice. The car gets squirrely on the freeway with grooved pavement. I would like to have the same size wheels and tires front and back. Some have speculated that the wider rear wheels and tires are carried over from the ICE version which is more rear-heavy. aarond12 wrote: 4. The "Ultraman" wiper blades could be consolidated into one blade like the US-model Yaris hatchback. The non-North American versions have only a single wiper. I'm guessing that a single wiper would not be sufficient for our wider windshield. aarond12 wrote: 7. Give us a switch to turn off the low-speed vehicle sound. Even the Prius has that. I believe that a new Dept. of Transportation regulation dictates that a low-speed vehicle sound must be included on all E.V. 's, and that this sound cannot be turned off. But I don't think this regulation is in effect yet. I think someone in this forum surmised that a switch could be installed in the wire to the speaker that produces the sound, so it might not be difficult to install a on-off switch yourself. aarond12 wrote: 8. Have some basic power consumption data easily available without having to using my KillAWatt device. Yeah, some of us would like a lot more instrumentation to let us know more about what's happening with our cars. aarond12 wrote: 9. Make the USB cable standard. The radio is already set up for it. C'mon. I have to pay $125 for the cable?! I believe someone in this forum posted recently about being able to add a USB cable without too much trouble. aarond12 wrote: 11. A more car-shaped design might be better accepted by the US market. Tesla's "frunk" is a great idea! A "frunk" would make the i-MiEV longer which would decrease its usefulness for those of us who live in cities where parking and maneuvering are easier with a shorter car. aarond12 wrote: 12. Put a badge on the back/side stating this is an electric car. Doesn't have to be gaudy; most other EVs have this. aarond12 wrote: That's about it for now. I'm really enjoying this new car! Me, too! My one-month anniversary just passed. Last edited by alohart on Mon Feb 04, 2013 12:19 pm, edited 1 time in total. 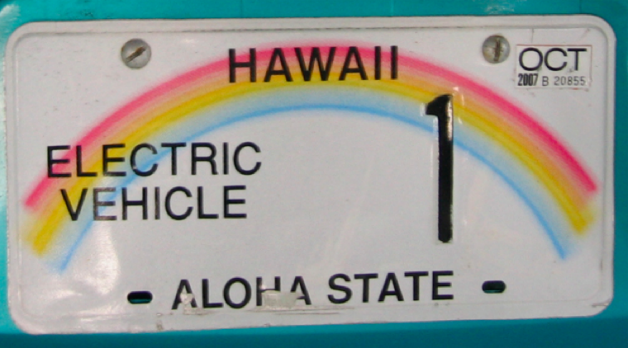 alohart wrote: My license plates include the text "Electric Vehicle", so "Electric Vehicle" is visible from all directions. Congrats on one month of gas-free driving! When I was in Hawaii last year, I noticed the special license plates like that. We don't have that in Texas. Maybe I'll find some license plate holders that say "Electric Vehicle" instead of the dealership name. Have only had the car for 5 days, and have zero complaints. Naturally, a little larger battery capacity would be nice, as I love driving the car, but in the Northeast, we have to use the heater a bit and it does reduce range. I like the 'Electric Vehicle' better, people are still confused by 'Green Vehicle'. With the limited range of the current electric vehicles ( Tesla excluded) is cruise really needed for the short trips that most drivers will be doing? 300% as many opening/closing cycles on the driver's door in order to check state of charge (and forgetting to unplug before entering the vehicle)? aarond12 wrote: 10. Set the rear seat hinges in the center of the seat back a bit so I can put a child car seat in the middle. You can do this now. I was able to attach two different car seats and position in the middle. I like when folks put their other vehicles on the signature line, as RobbW has added. It shows the automakers that, for instance, Robb was an excellent candidate for a new luxury touring sedan, but opted instead for an iMiEV. This shows that EV buyers can be normal consumers, and not just a core group of wing nut early adopters that have already voted with what few dollars they had. Wow! I've only been a member for a few days and already got a mention in a thread that I had not yet even posted in! And a positive mention, to boot! Yes, while "technically" (i.e. financially) we probably could have opted for a fancier more luxurious vehicle, my wife and I are usually adverse to dropping that kind of coin, especially on material "things". The two ICErs in my signature were both purchased used; the Sienna as recently as last September. We prefer to blow our wad on life experiences such as vacations and activities with our two daughters. You know, memories and experiences that you can't lose, destroy, get repossessed or stolen! During this most recent episode of car shopping, we almost talked ourselves out of purchasing a new vehicle on multiple occasions. The thought of taking on a hefty car payment when we already have two cars that are fully paid off was quite a weight on our shoulders. However, my wife's G20 is getting VERY long in the tooth and needs to be replaced. With all the incentives and rebates and 0% financing that Mitsu threw at us, it was hard to say no, especially as it meant a brand new car with a warranty. We have wanted a more fuel efficient vehicle for the longest time as nothing we have ever owned would rightly be considered "efficient". We never looked at EVs because we simply assumed their starting prices were well outside of our comfortable price range. Then came the i-MiEV and all that changed! We bought it to be our secondary car (replacing my wife's) and our commuting vehicle. Turns out this little mouse on wheels fits our hectic to-and-fro lives like a bug. With our daily commute and quick running about on the weekends, the i does everything we need it to for those purposes. I actually feel kind of sad for our minivan as I used to enjoy driving it immensely (other than the horrendous MPGs). Now, it just sits there unused and unloved. You can almost hear its block engine heart breaking in two. 1. Definitely agree that I would like to see a tasteful EV badge of some sort on the back end. Nothing too flashy, gaudy, or hippy; just stated matter-of-factly. My wife is concerned we'd look like pretentious d-bags flaunting our MPG superiority in other drivers' faces. I tried to push for a custom tailgate decal that read, 'It's Electric! Boogie Woogie Woogie!" but was promptly shot down before I got the second "woogie" out! Instead, I custom designed my own license plate frame that reads "got watts?" 2. Seat warmers all around! Why should only the driver ride in comfort? 3. I would love to see an option for a full-length moonroof or skyroof or whatever those entire-roof-is-a-window things are called. Not that I'd actually opt to pay for that option, but I can only imagine it would be neat as heck and make the interior feel more open and roomy. What the heck, make it standard since I wouldn't want to pay for it! 4. Definitely needs an armrest. Yeah, definitely. Definitely. I had to install my own as I just cannot drive without an armrest. 5. More cupholders! One in the rear cabin just isn't enough. There are two seats back there. It should have a minimum of two cupholders for the rear occupants. 6. Make the EVSEupgrade-style cable standard. Why force customers to pay up to an extra $1000 to have L2 charging capability? I already opted to have an L2 charger installed in my garage, but not everyone wants to have to go that route for quicker charging. 7. Offer light-colored interior as an option (tan/beige/brown/whatever). My wife HATES dark interiors, but we are making do with the i's dark interior since there are so many other positives about this car. But we definitely would have gone out of our way to get light interior if it was even an option. Heck, we went out of our way just to get the i-MiEV itself; having it shipped up from a downstate dealership and buying it sight unseen. 8. Yes, it's #8 but it's actually a biggie for me. Preload EVSE stations into the navigation system!!! How the heck does a 100% electric vehicle NOT come with charging stations loaded into the GPS? Seems like a total no brainer to me! And as far as I can tell, there is no way to get them loaded without meticulously hand-entering EVSE's as POIs. 9. The AVAS. C'mon. What's with the subtle hum? Why not give i owners the ability to select and change AVAS noises to suit their personalities? Why not a noise generator that sounds like the low rumble from a Mustang as you meander through downtown streets, and the subdued roar of a Ferrari as you sprint from the stop line? That would be frickin' hilarious!!! 10. Okay, I'm just going to stop after nine. I don't want to sound like a whiny complaining want-it-all.